The visual style of the Borg in Star Trek—with its protruding cables, dark metals, and monolithic sameness—is unmistakable, and has become, since the collective’s introduction in Star Trek: The Next Generation, iconic science fiction. They’re cool villains, and now you can merge your own technological uniqueness with theirs. Courtesy of hardware creator Cherry Tree, it’s now possible to place the Borg Cube under your desk, right next to your surge protector and that one leg if your office chair that always gets stuck. 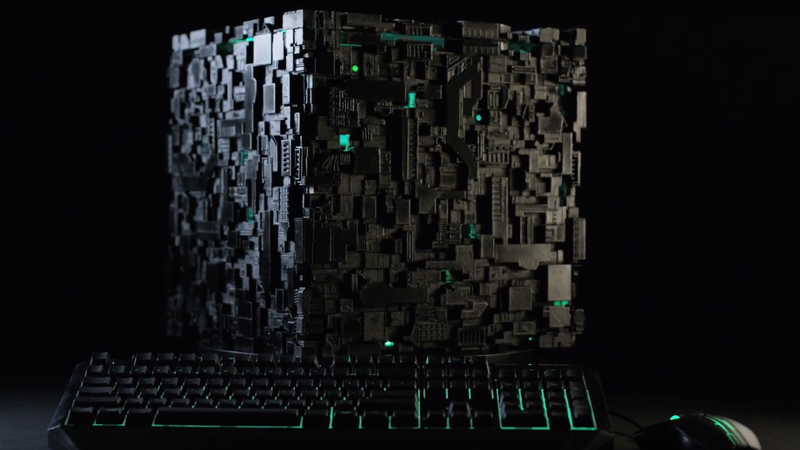 Their Borg Cube VR PC, available on November 24th, is a pitch-perfect recreation of the famed Borg vessel. Only, instead of a teeming mass of consuming machine lifeforms, there’s a gaming PC inside. The micro-computer, which is only 6" by 6" by 6", has some solid specs, too, with Intel i7-7700k CPU inside. It’s not terribly priced, either, with the cheapest model at $599 and the most expensive at $1299. A certain type of collector might want to throw in a graphics card for game playing purposes, but if one is spending money on a Borg computer that’s probably not too much of a hassle. Presumably, if placed near other computers, the Borg Cube will slowly but tenaciously consume them, transforming them into additional Borg Cube PCs. This isn’t listed on the specs, but some things are safe guesses. The computer is a limited edition product, with only 326 units remaining as of press time. They’ll start shipping on Black Friday, November 24th.